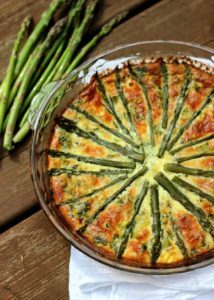 Home » BREAKFAST » GRAB THIS RECIPE/ASPARAGUS IS UNDER $2 A POUND! So I walk into the produce section of my favorite green grocer and what do I spy? Why asparagus at 1.99 a pound. Are they kidding me? 1.99 a pound? Sign me up and shut the door, I’m all in for this special. As if in a daze my cart magically makes its way over to the stand and I find myself loading bundle after bundle of that sweet stalk of green goodness into my cart. 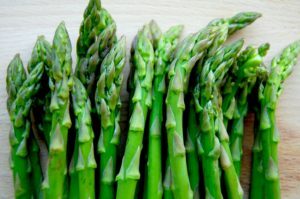 Asparagus is one of Mother Nature’s finest gifts and when it arrives in the grocery store is a sure sign that spring is just around the corner (as well as Pesach cleaning but that’s an entirely different discussion). By the time I get out of my chlorophyll induced stupor I’m in my kitchen, the proud owner of 5 pounds of the stuff and no real plan on how to use it up before it starts to wilt. My plan, take a deep breath, do a little recipe research and cook up a storm. Asparagus is part of the lily family and is sort of a first cousin to onions, leeks and garlic. Loaded with vitamins A, B and C it’s also a great source for folic acid. It is a very versatile vegetable that can be prepared by steaming, roasting, grilling or even stir frying it. The spears should be firm and green with tightly closed firm tips. Choose thin or thick stalks is just a matter of personal preference, I don’t really taste a difference between the two. Pass up asparagus with thick woody looking stalks. I don’t peel the stalks but I do cut off about 1/2 inch of the ends before cooking. If you’d like a little variety in your life look for white or purple asparagus. They’re the same as the green variety they’ve just been grown differently; the white is grown like some mushrooms, without light so it doesn’t produce chlorophyll. You will find that the white asparagus is a tad bit sweeter but so is the price point. The purple is pretty but it does loose most of its purple color when cooked. Preheat oven to 375. Grease 2 8 inch round glass baking dish with cooking spray. In a skillet melt the butter. Add the mushrooms and cook, stirring frequently for about 6 or 7 minutes. Remove the mushrooms and garlic from the heat and add the bread crumbs, Parmesan cheese, and pepper. Mix to combine and then press mushroom mixture evenly in bottom and up side of greased pan. Sprinkle the shredded cheese over the mushroom crust. Place the asparagus and mock crabmeat on top of the cheese. In a bowl of an electric mixer combine the cream cheese, eggs and 1 tablespoon of the parsley. Beat to combine and so that there are no lumps. Pour the egg mixture over the asparagus and mock crabmeat. Sprinkle the top with the 2 tablespoons of Parmesan cheese. Bake for 30 to 40 minutes or until the top is golden brown. Let cool for 5 to 10 minutes then serve. Serves 8. We share the same love for this veggie! Asparagus quiche and grilled are faves.